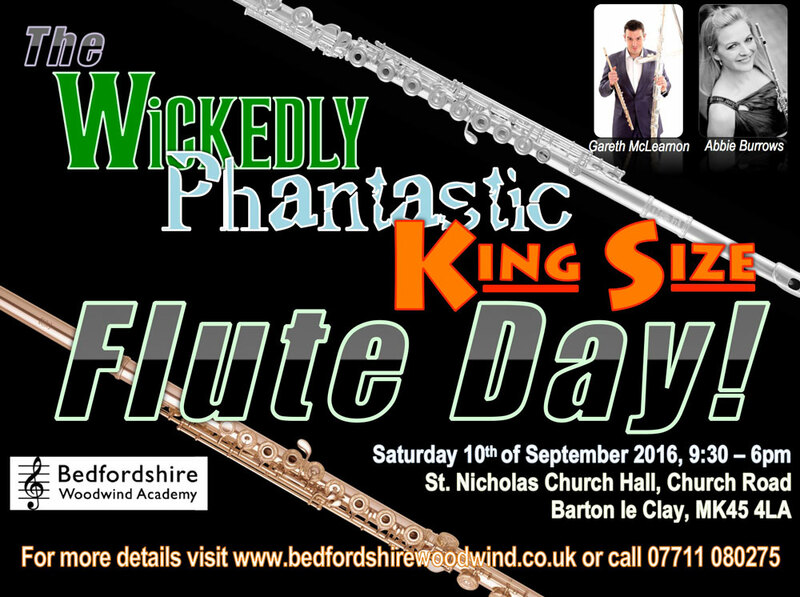 Wickedly Phantastic King Size Flute Day! Join the Bedfordshire Woodwind Academy Flute Ensemble for an musical theatre themed day with Gareth McLearnon and Abbie Burrows. The day will include ensemble performances of some of the most famous and favourite songs from the musicals of Broadway and the West End, as well as what is expected to be the UK Premiere performance of Gareth's new work, Lamasery Jigsaw for large flute ensemble. There will be a “meet the flutes” session where Abbie and Gareth will present their mammoth flute collection from big F Bansuri to Contrabass Flute and everything in between. And also a couple of breakaway groups where we can cover some other aspects of flute playing. Price is just £40 per person. Email Liz Childs for more information.